Angel Calleja is among the first group of winemakers to graduate from “La Escuela de la Vid” in Madrid in 1975. He immediately took over the Technical Department of Cuatro Rayas. Since then, he has continued to grow as a winemaker working to ensure the winery grows in production and quality. Angel is one of the most prestigious winemakers not only in our area but also nationally. 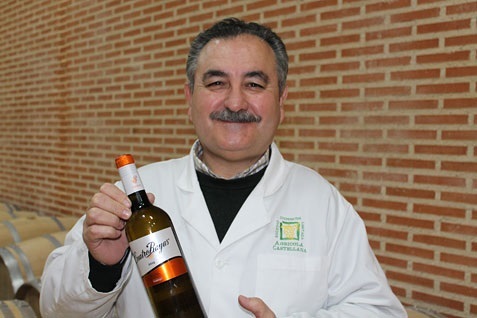 He is a member of the tasting panels of the Regulatory Boards of Rueda, Toro and Cigales, as well as a judge for the Zarcillo and Manojo awards. Made from a selection of our verdejo vines with an average of 25 years old. Pale yellow colour, clean and bright. On the nose it is delicately fragrant with aromas of fennel (typical of the indigenous variety Verdejo). Soft and persistent on the palate with hints of apple and banana coming through. Made from 100% sauvignon blanc grape, with a mean age of 20 years, situated at an altitude of about 700 meters in areas of sandy soil with boulders. Straw yellow with steely rim. Spacious and inviting to the nose with a citrus background. The palate is smooth and balanced with notes of passion fruit and pineapple. Vinified entirely from Verdejo grapes with an average age of 35 years old coming from the plot Pago de las Cuatro Rayas which belongs to four of the D.O Rueda municipalties as La Seca, Rueda, Rodilana and Medina del Campo. Well-known due to the high level quality of its vines. Pale yellow color with green glints. Intense lemon zest and minerals on the nose, with ripen apple and peach notes arriving with air. On the palate the wine offers an energetic melange of fruits and minerals and finishes clean, brisk and refreshingly bitter.